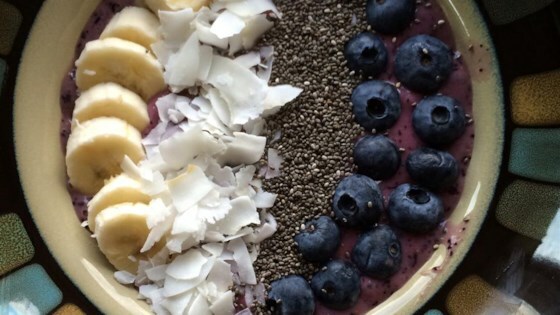 "Quick and easy blueberry smoothie topped with coconut, almonds, and banana." Blend blueberries, 1/2 banana, water, cashew butter, and vanilla extract together in a blender until smooth; pour into a bowl. Top smoothie with sliced banana, almonds, and coconut. This was delicious! The coconut really gave it something special. However, I would add a little milk to the smoothie mixture just to make it blend more easily. I like to use milk instead of water and peanut butter instead of cashew butter. Sometimes I like to add in yogurt and a handful or oats to give it a superb texture and taste.